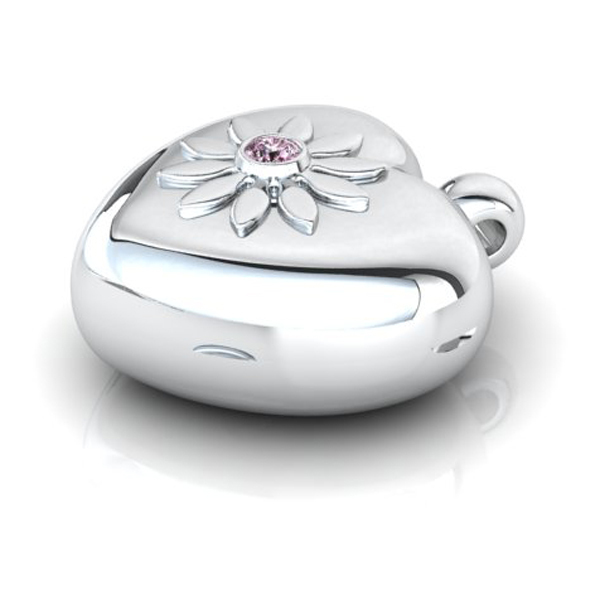 We offered a smooth flower design, in relief, on the front of the locket, which we set with a beautiful baby pink sapphire. She also requested, that we put some additional motifs on the other side of the locket. The customer wanted a seahorse and two interlocking hearts on the back. These were embossed onto the smooth surface of the heart. This bespoke locket heart shape has a round loop as a bail. This suited a belcher link chain, which is threaded through the spherical loop. We have made one other heart shaped locket, with a similar case to this one. But the finish, decoration and details are different. This adheres to our ethos of creating one-off and unique jewellery. All of our designs are bespoke and are protected under copyright and intellectual property laws. Each commission is undertaken personally, so that we can focus on each specific request. We believe that this gives each client a unique service and an end product that is exactly what they want.